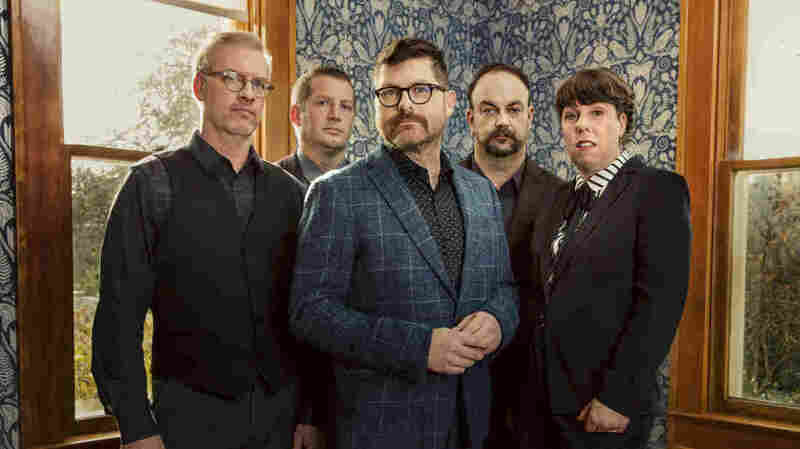 The Decemberists On World Cafe : World Cafe Lead singer/guitarist, Colin Meloy, talks about where the band's new sound came from and surprises you'll hear on the record. Since the early aughts, The Decemberists have been making a unique blend of lyrically dense indie-folk rock. But on the band's latest record, I'll Be Your Girl, the members deliberately switched up their sound, notably in their word economy and use of keyboards — Depeche Mode keyboards! That has a lot to do with where the band is at, but it also has a lot to do with John Congleton, the producer enlisted by the band and known for his work with St. Vincent, Lana Del Rey and Wye Oak among others. The nature of switching producers was tricky. It meant the guys wouldn't be working with longtime producer and friend, Tucker Martine. The Decemeberists' Colin Meloy joins us in this session and tells us how he broke the news, plus how he collaborated with Lin Manuel Miranda for a profanity-laden bonus track from Hamilton. Colin also talks about recruiting a chorus of neighborhood kids to sing on the record. But first, we start by hearing "Severed," the lead single from I"ll Be Your Girl.